Free agency in the National Football League isn’t exactly free, as the Cleveland Browns are learning when it comes to linebacker D’Qwell Jackson. 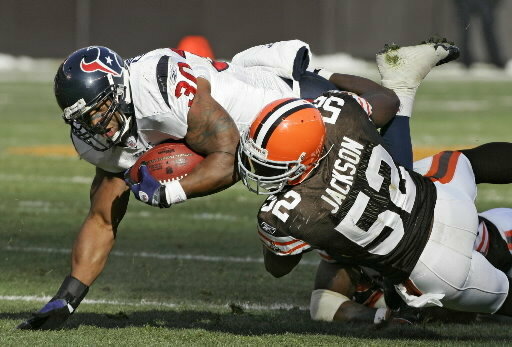 A free agent, Jackson finished the 2011 season with a team-leading 158 tackles and an NFL-leading 116 tackles. He says he would like to stay with the Browns. Jackson reportedly wants a five-year deal, which is understandable. He is 28 years old and this is probably his last chance to sign a big deal. But he missed 26 games with injuries in 2009 and 2010, which makes us question if the Browns should give a multi-year contract to someone that may not be able to stay healthy. On the Browns end, the team could use the franchise tag on Jackson, keeping him for another year and, if he looks like he can stay healthy, sign him to a multi-year deal after next year. The franchise tag number for a linebacker is reportedly $8.8 million. With the Browns having between $21 million and $29 million in cap space (depending on how much of their unused cap space from last year they roll over) Jackson alone would eat up anywhere from 30 percent to 42 percent of the team’s available cap space. Throw in Chris Gocong, who will make $4.5 million this year, and the Browns would have two of the 20 highest paid linebackers in the NFL. (Thanks to @cpmack for pointing that out on Twitter). When you look at it that way, we really have to wonder what the Browns will do. The one-year option makes the most sense because of Jackson’s injury history, but can the team really tie up that much money in one player and make Jackson the fourth-highest paid linebacker in the NFL? Heckert is definitely going to earn his paycheck on this one. At least one Philadelphia Eagles beat writer things it is time for the team to cut ties with wide receiver DeSean Jackson. Whether Jackson returns for a fifth season with the Eagles, either as the recipient of a new long-term contract or with the 1-year franchise tag around his neck, will have everything to do with what Jackson’s agent, Drew Rosenhaus, is telling club president Joe Banner, and nothing to do with the 25-year-old Jackson finally deciding to act like a grown up last December, writes Paul Domowitch of The Philadelphia Daily News. He finished 32nd in receptions among wideouts last season and 49th in 2010. Forty wide receivers had more touchdown catches than Jackson’s four last season. Twelve had as many or more 40-plus yard catches. He had just two 100-yard receiving performances last season and has just three in his last 23 games. He’s got just five touchdown catches in his last 22 games. Over the last two seasons, he has been targeted 19 times in the red zone, but had just six catches and four touchdowns. Is that someone we really want the Browns giving big money to? One last item on free agency, this time from Peter King in his Monday Morning Quarterback column. Oakland and Carolina, third-place teams who were a combined 14-18 last season, are two of the four teams who were over the projected salary cap of $120.4 million last week. Still upset the Browns didn’t go crazy in free agency last year?